In regions where landscapes have been/ have the potential to be heavily alternated by humans, conservation planning becomes a tricky question. Limited protected lands and financial resources mean that managers have to prioritize among different conservation goals to maximize the outcome. The scale and accuracy of information on wildlife distribution and migration pattern, habitat use and quality, shifts of range of ecosystems under climate change, and potential urban development will greatly affect these decisions, and hence need to be carefully reviewed to ensure proper return on conservation investments. 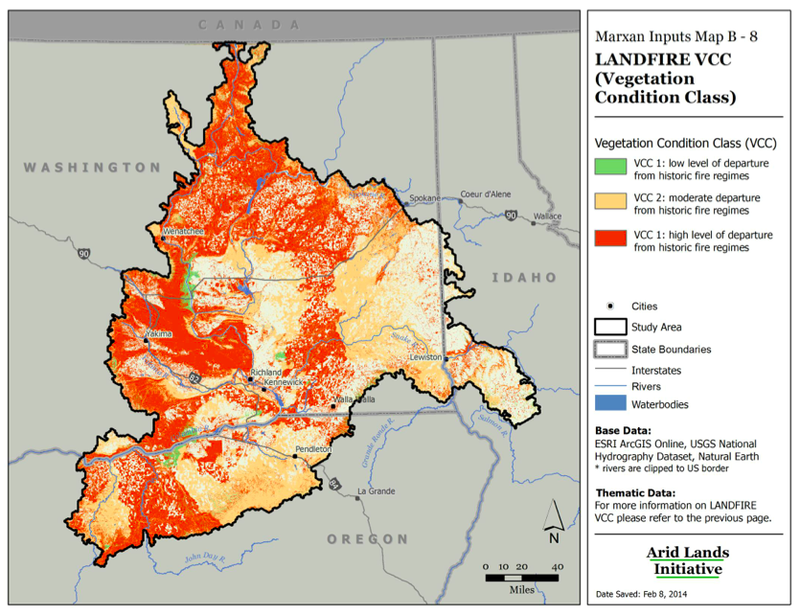 The following examples focus on the Columbia Plateau and surrounding areas in eastern Washington state, where native ecosystems have been severely fragmented due to agricultural developments and land conversions. *Note: to access full resolution click on the images to enlarge diagrams/maps. 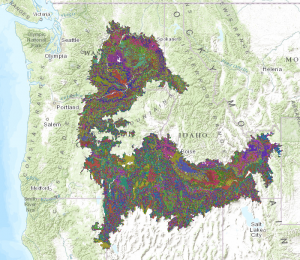 This case study evaluated proposed land protection plans by examining how much geophysical landscape components may be preserved within the protected areas of three regions in the Washington state, all with varying ranges of elevations and vegetation types. The outcomes suggested that conservation prioritizes shifted depending on the chosen variables, but the phenomenon was more predominant on one particular area. The proposed plans could represent under half or less land facets represented by any of the areas, and often conservation plans protected ecosystems better than land facets. 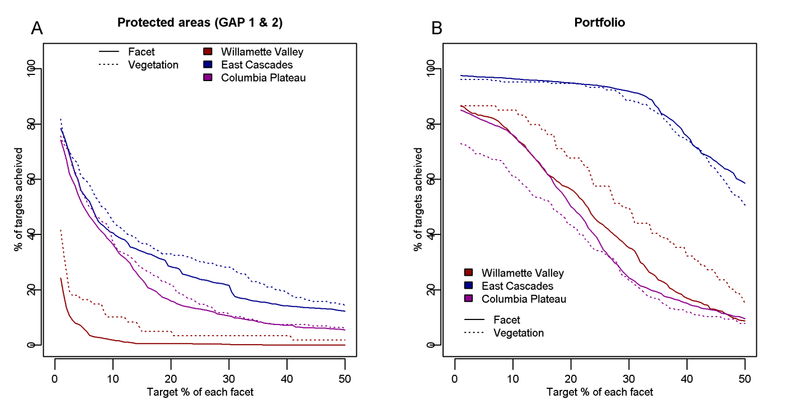 Investigation of Columbia Plateau’s eco-regions were further divided into sections that reviewed the connections between focal species and landscape integrity, the status of linkages and barriers of corridors, and the effects of climate change on the region. 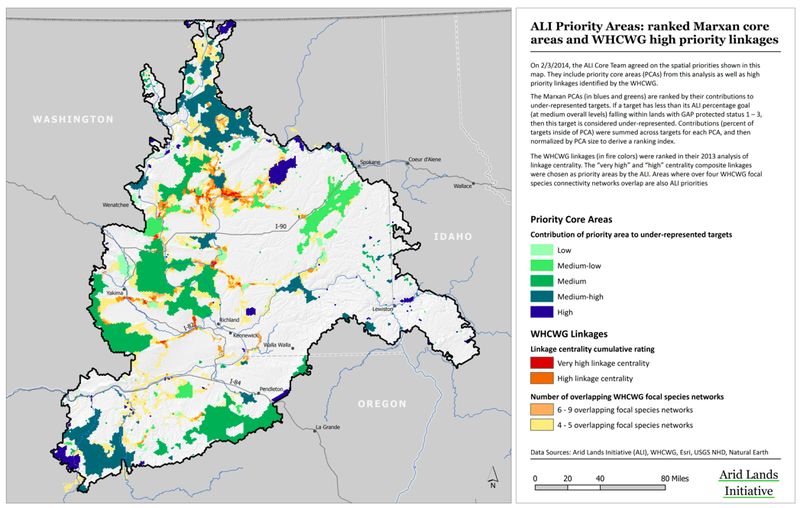 Each subset was a continuation of a previous state-wide analysis (2010) that highlighted Columbia Plateau’s urgent need for a detailed and integrated conservation plan. 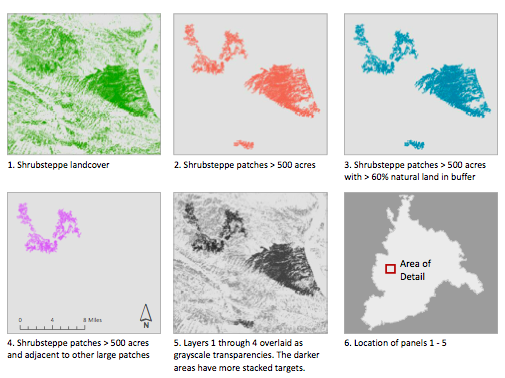 While the previous example focuses on the types of land facets conserved through programs, this example emphasizes the importance connectivity of fragmented eco-regions and how fine-scaled habitats and corridors respond to future climate changes. The recently completed work is a continuation of the previous WA Connected example, led by the Arid Land Initiative in collaboration with US Fish and Wildlife Services. 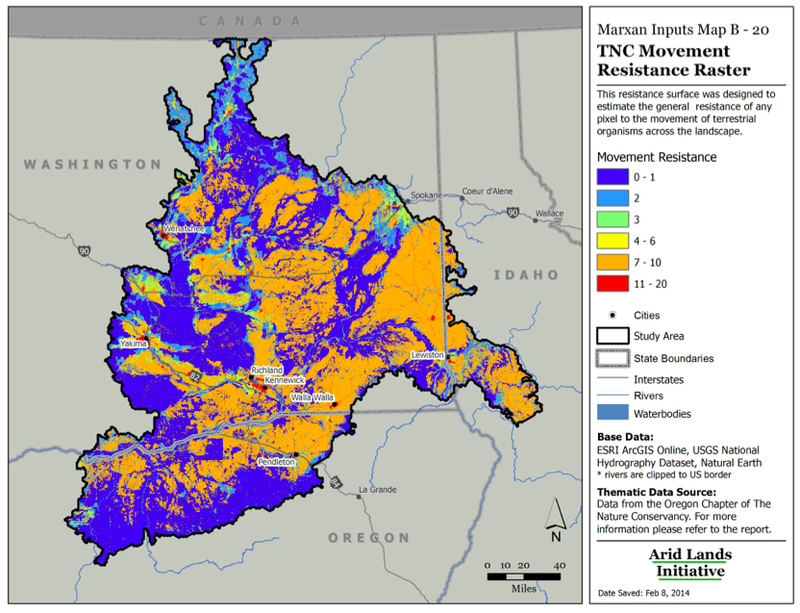 The Marxan model run by the team incorporated much previous work done by other groups, and was modified to include land cover surveys, species distributions, and land facets that greater than 1,000 total acres. 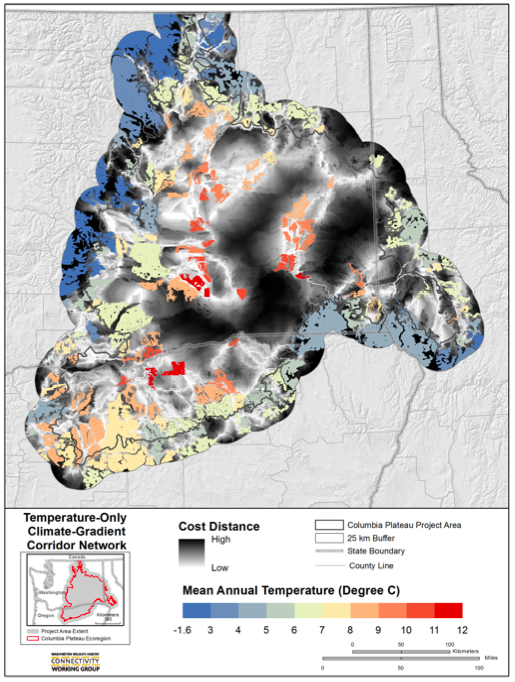 The summary is perhaps the most thorough report of the conservation status of the Columbia Plateau to date, though future in-field ecological integrity assessments and climate change analyses (2014) will complement the work furthermore. »NPLCC webinars integrating conservation management with climate change projections. 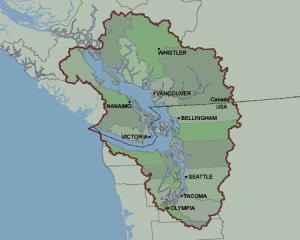 Both the Salish Sea and the Cascades Mountains have encountered unique conservation challenges: one is a trans-boundary network of coastal waterways that has been inhabited by humans over 10,000 years, and the other a series of mountains extending from southern BC all the way down to Northern California, its lands are steadily transferred into agricultural fields on both sides of the border. Historically the two ecosystems, comprised of a wide range of terrains and ecoregions, represent a major part of the northwest Pacific landscape, but political boundaries and the consistent and increasingly extensive human modification have made protecting these ecosystems difficult. Image credit (left to right, clockwise): Walter Sigmund, Shannon, both via Wikimedia Commons [GFDL CC-BY-SA-3.0-2.5-2.0-1.0]; Environment Canada. Beginning in the 1980s raised awareness of conserving Pacific Northwest ecosystems brought about several plans led by both governmental departments and NGOs on both American and Canadian sides. The initiatives began as sub-national agencies moved beyond political borders to arrange environmental, social, and economical policies that protected the Puget Sound waters and adjacent Georgia basin. The emphasis of social-economical policies was distinctly different compared to conserving “traditional conservation lands”, referring to large areas of intact lands with less human inhabitancy (e.g. the Great Bear Rainforest). Priorities to develop on-the-ground tools with local communities and willingness to establish adaptive strategies accommodating the then-future growth of population and climate change impacts led to a successful conservation story. Conservation networks and transboundary research are gaining significance in protecting terrestrial ecosystems and species that use land corridors to migrate. 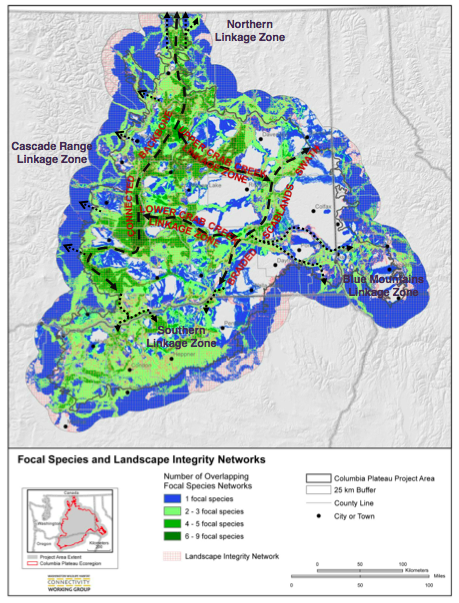 Recent establishment of transboundary research agencies such as the Cascadia Partner Forum and the Great Northern Landscape Conservation Cooperative (GNLCC), in addition to increasing transboundary research led by the Nature Conservancy and NPLCC, is likely to facilitate the exchange and application of information collected by local conservation organizations such as Coastal Douglas-Fir Conservation Partnership (CDFCP), Island Trust, and Washington Wildlife Habitat Connectivity Working Group (WWHCWG). 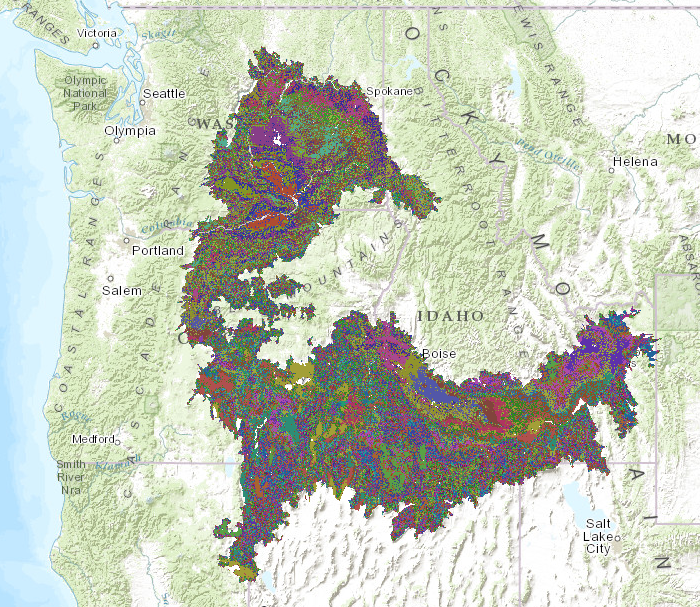 »There’s also bird communities and climate change plans by AKN and Klamath Observatory. Need to fit them somewhere.